David Cushley is under no illusions as he prepares to kick-off the season with new club Crusaders. 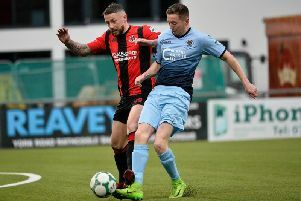 Cushley joined the Danske Bank Premiership champions in May from Ballymena United, one of a number of high-profile signings made by Stephen Baxter. The Crues start their title defence at home to Cushley’s former club on Saturday afternoon, looking to end a six-year wait for a win on the opening day of the season. The last time the Shore Road men enjoyed a winning start in the league was in 2010 with a 3-1 win at Donegal Celtic. Looking ahead to the new season, Cushley is anticipating a massive battle for the Gibson Cup. “It’s going to be very competitive,” said Cushley. “So many clubs have made good signings, especially the players coming in from across the water. Cushley was Ballymena United’s glamour player in recent seasons, with the forward’s wonder goals becoming a prominent feature to his game. But after joining a Crusaders squad laced with talent, the 26-year-old admits he needs to raise his game. “I’m at the league champions now and I know I’ll have to up my game,” he added. “I have been working hard and my aim is to cut out the stupid wee mistakes. It goes without saying you have to work harder to get in the squad and stay there, but I’m relishing that challenge. Elsewhere on Saturday, Linfield – who finished second to Crusaders last season – kick-off their Premiership campaign against Ballinamallard United at Ferney Park. Glentoran – with new signing Nacho Novo – entertain Dungannon Swifts at The Oval while Cliftonville travel to newly-promoted Ards. Glenavon start their season against Carrick Rangers at Mourneview Park.